We know it can be challenging to find a veterinarian to treat your ailing pal in the middle of the night or on holidays. Niagara Veterinary Emergency Clinic is an after-hours emergency veterinary clinic in Thorold which has been treating small pets since 1992. Keep our contact information handy in case you have a medical emergency outside of your usual veterinarian’s regular business hours. The Niagara Veterinary Emergency Clinic has doctors and technicians available every hour of the day, every day of the year for treating small animals in emergency situations. If your pet is experiencing an emergency, please try to call the number displayed on this page before driving to our Thorold clinic so we can prepare for your arrival. Our email is not monitored 24 hours per day – call us directly with your pet health concerns, instead of emailing, as time can be critical in an emergency. 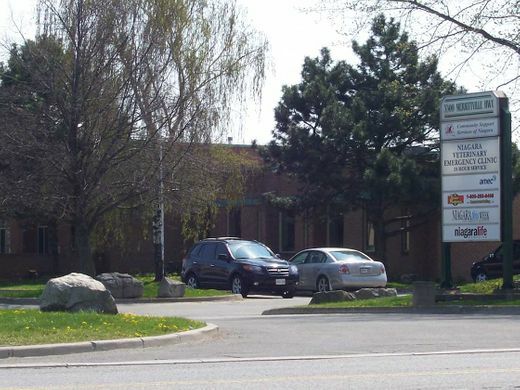 We are located 1/2 km from Brock University, which is at St. David's Rd & Merrittville Hwy. Private parking is available. If you’re interested in joining the Niagara Veterinary Emergency Clinic team, please complete our convenient eform and submit your résumé.